Kamen Rider Gaim & Kamen Rider Baron Return In Kamen Rider Zi-O! On the next phase of his journey across time & space, Kamen Rider Zi-O will visit the world of fan-favorite fruit dancer Kamen Rider Gaim! *Gaku Sano will once again reprise his role as the titular Kamen Rider Gaim! He appears to offer guidance to the wandering Sougo. 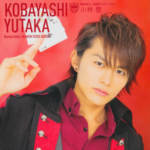 *Not to be outdone, Yutaka Kobayashi will be returning as Kaito Kumon- better known as Kamen Rider Baron! Kaito will offer his expertise to a still-skeptical Geiz. This adventurous meeting of Riders is currently scheduled to air November 18 2018! Be sure to join in our Ongoing Kamen Rider Zi-O Discussion Thread to share your thoughts & fears about this epic crossover! Olympics Arms? Yutaka Kobayashi, aka Kamen Rider Baron from the Kamen Rider Gaim series, is going to be carrying something other than a banana spear. First reported on by BOYS AND MEN, and subsequently reported by the Tokusatsu Network, Yutaka Kobayashi will be one of the individuals representing Japan by carrying the 2018 Winter Olympics torch. The 2018 Winter Olympics will be in PyeongChang, South Korea, starting on February 9th 2018 and running through February 25th 2018. As if you needed another reason to watch the 2018 Winter Olympics. Our congratulations to Yutaka Kobayashi on this tremendous honor and our assurances that toku fans across the world will be tuning in to see one of their favorites on the world’s stage. We have some new images of some as-of-now unreleased S.I.C. Kamen Rider Gaim figures. On display currently are none other than S.I.C. Kamen Rider Ryugen Yomotsu Heguri Arms, S.I.C. Kamen Rider Baron Lemon Energy Arms, and S.I.C. Lord Baron. 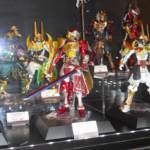 Some of these were first revealed at the Tamashii Nations event last month. There is currently no release information for these characters as they are simply prototypes. If that should change we will let you know! Thanks to @dewachang on Twitter for the images! › Companies: Tamashii Nations › Characters: Kamen Rider Baron, Kamen Rider Ryugen › Toyline: S.I.C. 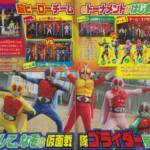 Kamen Sentai GoRider Spinoff Series Officially Announced! Toei has announced a special three-part spinoff as promotion for the upcoming Chou Superhero Taisen project featuring a brand new team of heroes: the Kamen Sentai GoRider! This team blends the iconic outfits of founding series’ Himitsu Sentai GoRanger and Kamen Rider 1. The GoRiders will all be portrayed by veteran Kamen Rider actors, all with something interesting in common: they should no longer exist in this World. Kamen Sentai GoRider will be released online starting March 25 2017! As the perfect followup to the upcoming S.I.C Drive Type Speed, Hyper Hobby magazine showcases the release for S.I.C Mashin Chaser! 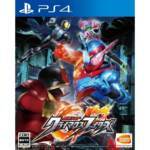 S.I.C Mashin Chaser is seemingly(as of this post) a mass retail release scheduled to come out May 2017 for 9180 yen. In the magazine, he’s shown using the Break Gunner and Wing Sniper so those should be part of his main accessory count, though it’s unknown if he’ll have the other Viral Core weapons at this time. 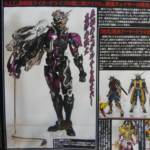 In addition to Chaser, the scan shows brief glimpses of S.I.C Baron Banana Arms and Zangetsu Melon Energy Arms, though details on those pieces are still forthcoming. › Companies: Bandai of Japan, Tamashii Nation › Characters: Kamen Rider Baron, Mashin Chaser, Kamen Rider Zangetsu Melon Energy Arms › Toyline: S.I.C. This list will grow and change as more new figures are revealed and release info becomes known for others. Stay tuned for all the exciting reveals this weekend! 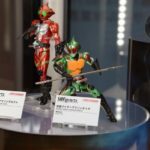 Tamashii Features 2016 officially begins May 21st, the image currently being relayed thanks to Amiami Hobby News are from a preview/press event.